Anyone who has looked into installing solar panels in Australia would have quickly learned that north is the best direction for solar panels. If north is not an option, northwest and northeast are generally the next best options, usually followed by due west and due east, depending on the circumstances. But what about south-facing roofs – are they a good place for solar panels? A row of southeast-facing roofs with potentially significant shading from tall backyard trees. The conventional wisdom says ‘no’ – solar should never be installed on a south-facing roof. Solar panels work best when they’re directly facing the sun, and the sun sheds the most light during the middle of the day, when it’s to the north of Australia. 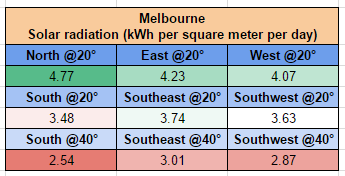 Interestingly, many solar calculator tools (including our own) do not have south-facing options. But as solar PV system prices have come down in recent years, the prospects of installing on a south-facing roof look reasonably good – especially if the roof has is also facing slightly to the east or west. We looked at north, east, west, south, southeast & southwest (ignoring northeast & northwest for now) at a tilt angle of 20°, which is relatively close to flat. The flatter a south-facing roof is (i.e. the closer to horizontal), the better it will be for solar. We also took at look at a tilt angle of 40° for the south-facing orientations, mainly just to show that a south-facing roof with a steep pitch is probably not a good place for solar panels. 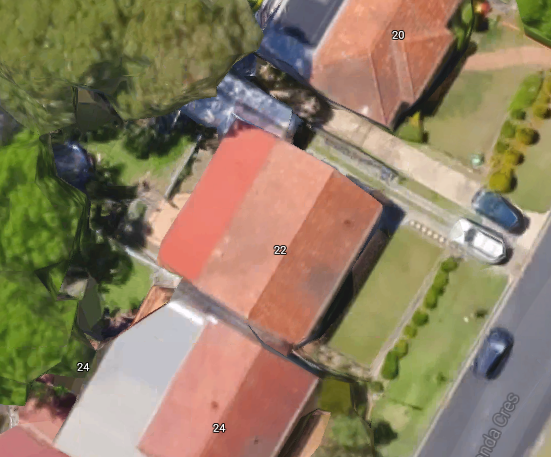 The results backed us up on this theory, showing poor solar radiation levels for south-facing roofs at this steep tilt. The other results were also relatively unsurprising, but it is handy so see the differences brought into sharp relief. 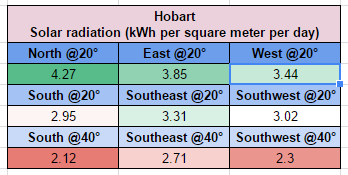 The tables below of course confirm that north, east & west are the best orientations for solar panels, but they also show that even south-facing roofs could offer viable returns as well. As an example, a roof facing due south in Brisbane will receive almost as much sunlight as a north-facing roof in Hobart! *Not discussed here is the case for going solar in the tropics (e.g. Darwin and far north Queensland). If you live in a tropical area, your solar panels will be to the north or to the south of the sun, depending on the season. A flat or near flat tilt angle is often the best approach in these situations – although panels can be also tilted slightly southwards to produce a bit more power when summer cooling loads are high. None of the scenarios discussed in this article take into account the fact that tilt frames can turn a south-facing roof into a north-facing solar array. The main considerations in this case would be about additional costs (would the additional solar yields offset the higher system price? ), the durability of the frames (are they properly suited for the worst-case high-wind scenarios in your location/climate?) and aesthetics (how would the frames look on your roof?). The point is this: Don’t write off solar for your home just because you haven’t got any unshaded roof space that faces north – especially if you live north of Sydney, where sunshine is available in abundance (most of the time). The amount of solar radiation you receive is not the only factor, however. It’s important to note that solar PV systems in Melbourne promise attractive financial returns for households despite relatively low solar radiation levels. In fact, solar even makes sense for Melbournites despite the low cost of grid electricity and the relatively high price of solar systems there – factors that can often confound the business case for having solar installed. 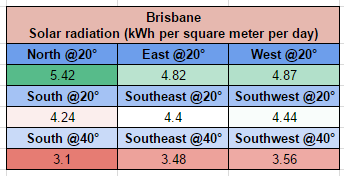 So if you live in Brisbane or Sydney, for example, going solar with a southeast-facing roof could be potentially more attractive than going solar with a north-facing roof in Melbourne. Both Sydney and Brisbane are home to higher grid electricity prices and lower solar system prices; going solar in these cities is an easy choice. Wondering if solar is worth it for your home? 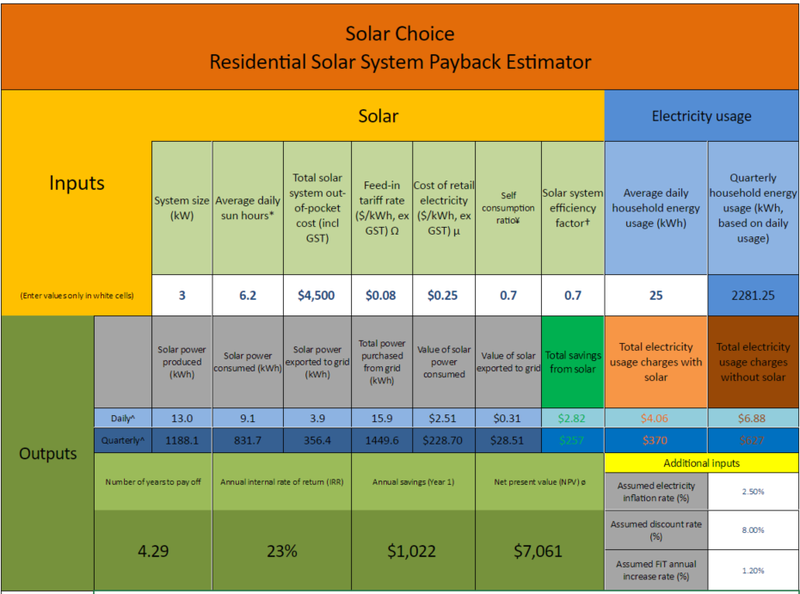 Try out or Solar PV System Payback Estimator. If you have a south-facing roof, you can plug in figures from the tables above to find out if solar is worth it for your home. How is the solar energy produced throughout the day? The other relevant thing to keep in mind is that easterly and westerly solar panel arrays produce more energy during the mornings and afternoons, respectively. The best way to get the most out of your solar system these days (with low solar feed-in tariffs in most states) is by ‘self-consuming‘ as much of the solar energy as possible while it is being produced (this is generally true even if you have battery storage). Most households consume the bulk of their electricity during the afternoon hours, so that north & west-facing arrays are usually best for solar self-consumption. But with the right home energy management system – or even just a little bit of additional consciousness around energy usage – a household could easily take advantage of the early-morning production of an east or southeast-facing array by running more appliances in the morning. 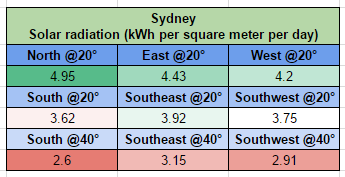 The table below (hover your cursor to see details) shows solar radiation levels in Sydney on a sample day in January across all eight orientations. As you can see, the east-facing arrays produce more energy earlier in the day, with the opposite being true for west-facing arrays. Read our article: Does solar power make sense in 2017?